The intention of this chapter is to examine how British travel journalism provides its readership with cultural frames of reference for different tourist settings around the world. Specifically, the focus here will be on a set of touristic experiences that have long been established in collective British imaginings of places ‘out there’: safari holidays in Africa. Drawing on a selection of articles from the travel supplements of British weekend newspapers, The Sunday Times and The Telegraph, I address two principal concerns. First, I interrogate representational strategies deployed in travel journalism on these two regions and how they are constitutive of broader British imaginings of Africa. Specifically, I ask in what ways the representational strategies of authenticity function in locating aspects of the past in the present. Second, it is important that these representations are considered in terms of the commercial context in which they are produced. 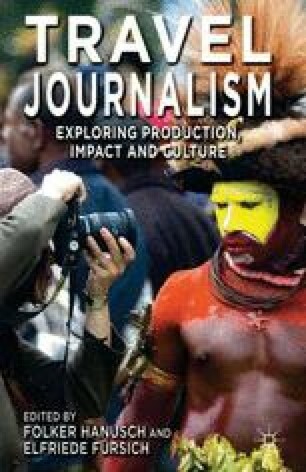 In addressing these concerns and examining the representational strategies in play in specific articles, the intention is also to explore how this coverage is indicative of the broader cultural frames of reference through which travel journalism views its ‘others’. Mahmood, Reaz (2005) ‘Travelling Away from Culture: the dominance of consumerism on the Travel Channel’, Global Media Journal, 4.6, http://lass.calumet.purdue.edu/cca/gmj/sp05/graduatesp05/gmj_sp05_graduateTOC.htm,accessed 6 May 2012.